This looks and feels like a big bird and judging by the dark bill and lack of clear gray in the upperparts probably a first year bird. The heavy dark bill alone is probably enough to identify this individual but we should look at several other field marks. The underparts and head are largely white and the upperparts are spotted and barred producing the familiar checkered look of a first year Great Black-backed Gull. Photographed in Kenosha Wisconsin on April 5, 2003. The extensive clear gray on the upperparts tells us that this bird is an adult. The gray isn't dark enough for a black-backed gull and is too dark for a Glaucous or Iceland Gull . The pink legs eliminate Ring-billed and California Gull so that leaves Herring and Thayer's Gull to consider. Since we can't see the eyes we'll have to look for other field marks. What we can see is the underside of the outermost primary on the left wing, which is mostly pale. On an adult Herring Gull the underside of the outermost primary would be mostly black with a white spot. 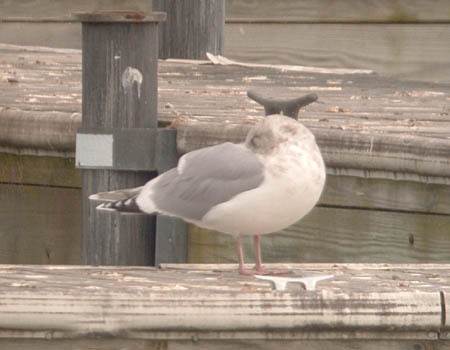 Other marks that support Thayer's Gull include the larger white tips on the primaries (visible on the bird's right wing), the brighter pink legs, and the cloudy streaking on the head and neck.This adult Thayer's Gull was photographed at North Point Marina in Lake County, Illinois on December 27, 2003. Judging by the bicolored bill and brownish wash to the wing coverts this bird is not an adult. 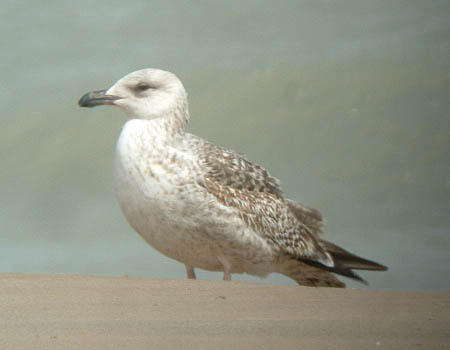 The upperpart color is too light for any black-backed gull and too dark for a Glaucous or Iceland Gull. The upperpart color also looks too dark for a Herring Gull and the bill is on the small side for that species. How about Ring-billed Gull? The bill seems small enough but again the mantle is darker than what we would expect for a Ring-billed Gull. A Mew Gull would have an even thinner, more pointed bill than our candidate. A Thayer's Gull wouldn't be quite as dark as our bird and would have more prominent white tips to the primaries at this age. How about a California Gull? The upperpart color and bill size seem right and that's what this bird is. 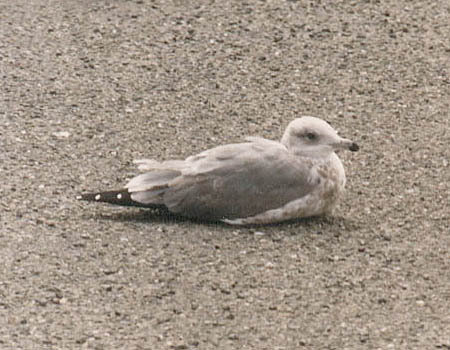 This third year (probable) California Gull was photographed somewhere in California in the mid-1980's.